Cover: mountboard covered with a florentine patterned tissue paper. Closure: fine gold thread finished with gold glass beads. Text pages: made by folding and cutting one A4 sheet of white card stock, hus producing a 'book within a book'. Background: scraped pastels with a dusting of gold bronzing powder. Lettered with Mitchell Shadow nib (50) and filled the black inked outlines with shades of yellow and green gouache. My quotations are on the subject of Spring. 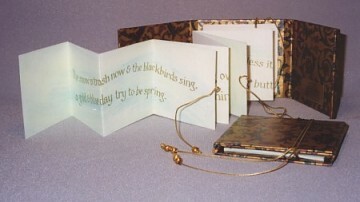 Book 3⅛″ x 3¼″ (8cm x 8.25cm).